The Dodge brand of Auburn Hills’ FCA US is offering a Stars and Stripes Edition for its Challenger and Charger models, designed with military-inspired touches to celebrate the men and women who serve the country. Dealers will be able to order Stars and Stripes Editions starting in May and they will be available for purchase this summer. The package will have an MSRP of $1,995 although the company offers a $500 cash allowance to active military buyers through its Honoring Those Who Serve program. The exterior of the Challenger and Charger Stars and Stripes Edition features a satin black and silver accent center stripe, satin black American flag fender decals, 20-by-9-inch mid-gloss black wheels, and black badging. Inside, Stars and Stripes Edition models feature gloss black interior accents, black-on-black cloth seats with an embroidered bronze star, dark brushed interior bezels, an antique bronze instrument panel badge, and bronze accent stitching throughout. Another factory-custom look, available for the first time on Charger SRT Hellcat, is the painted satin black appearance package that includes a hand-painted satin black hood, roof, decklid, and spoiler. It carries an MSRP of $3,495. Another Challenger/Charger variant is the brass monkey appearance package, previously only available on SRT models. Now, it is available on additional Challenger and Charger models with an MSRP of $795. 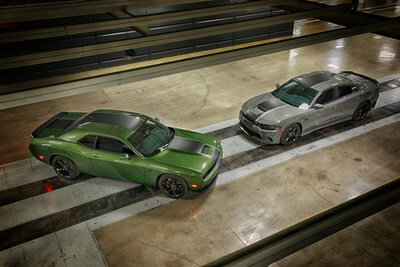 All of these new Charger and Challenger options will be displayed at the New York International Auto Show April 17-28.